There is much to be said about the joys of outdoor recreation in a cold, wintry climate. The scenery is stunning, the winter hiking is made easier without the hot summer sun beating down on you, and you’ll get a better workout from having to trek through the snow. Unfortunately, one of the challenges in cold-weather camping is trying to find a suitable sleeping bag that will keep you warm on sub-freezing nights. Most sleeping bags simply can’t muster up to the task, offering warmth only down to a certain temperature. Luckily, a double sleeping bag can help take some of the guesswork out of the equation. A sleeping bag for two allows you to bypass the need to lug around two separate sleeping bags for two separate people, while also increasing the overall warmth of a single bag. How? When you cuddle up with your sleeping partner, you share heat, reducing the amount of work that the double-wide sleeping bag needs to do to keep you warm. Therefore, a double sleeping bag is a great choice if you are already planning on camping with a partner – or even if you just want a bit of extra room! 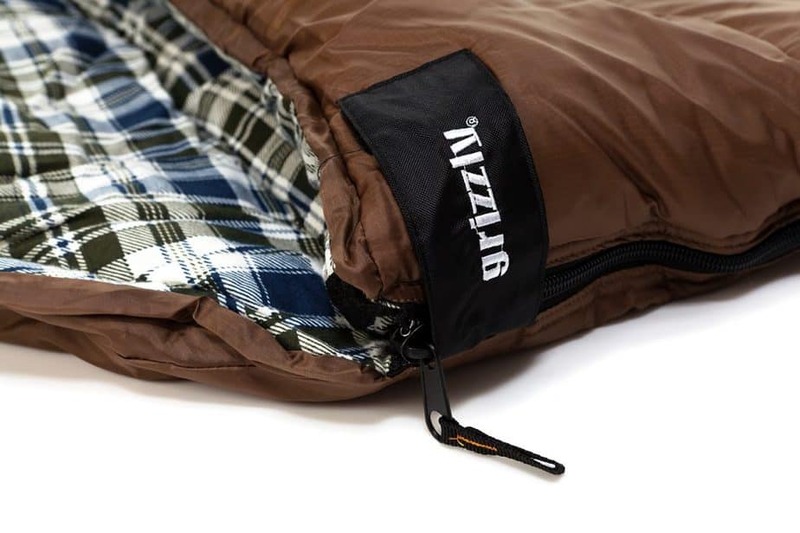 Even better, the Grizzly by Black Pine Double Sleeping Bag offers warm, insulating sleeping comfort, keeping you warm in sub-zero temperatures. Consider this double sleeping bag as you embark on your next cold-weather camping excursion. The most notable feature and benefit of the Grizzly by Black Pine Double Sleeping Bag is that it is rated to temperatures below -25 degrees Fahrenheit – a significant rating given that most double sleeping bags are only designed for summer camping in temperatures above freezing. The bag is made with microfiber insulation and has over-sized draft tubes and chest baffles to keep you warm even in the chilliest conditions. This double-wide sleeping bag measures ninety inches long and sixty-five inches wide, making it ideal for even larger campers. While it weighs a bit more than comparable models – coming in at just under fifteen pounds – it more than compensates for its extra weight by the warmth it provides on cold winter nights. This durable sleeping bag comes with large, heavy-duty double zippers. It zips open from both sides so that you don’t need to disturb your sleeping partner when getting up. This feature also makes it easy to unzip partially or fully if you become too warm in the middle of the night. It also comes with a rugged stuff sack with compression straps to make it easier to tote through the woods. It’s easy to keep clean as it is machine washable (although it should be noted that you will have to line dry it). When purchasing this double sleeping bag, you actually have a few different choices. You can choose from three different temperature ratings (-25, 0, and +25 degrees) to accommodate a range of camping conditions. There is also a choice between a cotton duck canvas or polyester ripstop exterior fabric, but both come with two-layer offset construction so that your seams don’t overlap and cause cold spots. 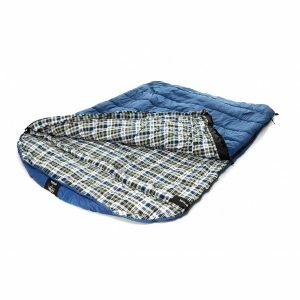 This bag is much warmer than comparable double sleeping bags, offering protection from the cold in even severe temperatures. It has a durable ripstop nylon shell with two-layer offset construction. With a solid flannel lining, you won’t be able to catch a chill. 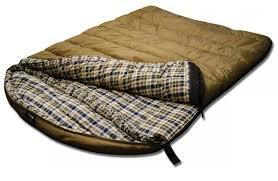 Customers love the warmth and durability of this sleeping bag. If you are a fan of cold-weather camping, it keeps you nice and toasty. The inside of the sleeping bag does not bunch up, and the tightening strings make it easy to carry and adjust. Because it is easy to wash and tote, it is a good option if you have small children, a pet, or tend to just be hard on your camping equipment. This is a plush, cozy sleeping bag that is basically indestructible. It is not constricting for people of any size, allowing you to cozy up with your partner or spread out on your own. Even better, some customers have reported that you can combine this double sleeping bag with other double Grizzly sleeping bags to make a sleeping bag for four, providing additional warmth, convenience, and comfort. This is by far the best double sleeping bag for winter camping, and just one of the best sleeping bags all around in general. It offers superior comfort and durability, allowing you to camp in harsh climates either with a partner or by yourself. If you’re looking for the sleeping bag that will finally keep you warm when the temperatures plummet, this is definitely the way to go.